Is it obvious that I love cardigans with all my heart? I don’t remember the last time I wore a pullover! I started this lace project quite a while back, but had a bunch of screwups that resulted in several ripping sessions. Now I definitely, definitely know how to knit this pattern though! I didn’t know how far my yarn would go (I have 3 skeins) so I cast on provisionally for the body, knit up to the underarm, cast on provisionally for the sleeves as well and knit a seamless set-in sleeve for the upper body. I love it! The yarn amount situation is looking good, too. 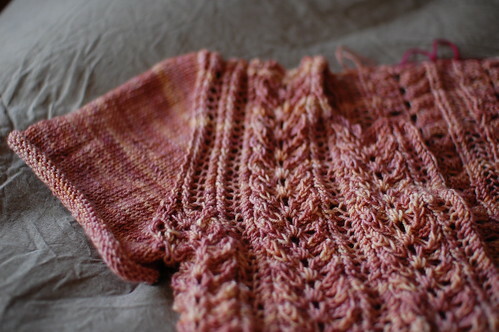 Now I’m going to knit the sleeves down a bit, then decide what to do with the body. The idea was to just have the lace from the waist up, but now I’m wishing I’d done the whole thing in honeybee! I love this pattern. But I think what I’ll do is keep it as sort of a cropped shape, with a wide stockinette hem at the bottom. Still needs button bands and a neckband too. The pattern for this one will eventually be released as well, but it’s going to be pretty complex to work out because of the patterning and the set-in sleeve! My math could probably use the challenge though. I love the yarn/stitch pattern combination! SO pretty. I’m looking forward to the result! I hope you do publish it! It is absolutely gorgeous – the color and the lace work so well together. Ooooh, I really love this one…I can be patient! Oh wow, I like that very much. I think I’d like a garter border on it. Oh wait, slap me! I’m not the designer….. I’ll be very interested to see what you come up with. this looks great; that colorway looks fabulous with that stitch pattern. i’ve been looking for a good lace cardigan pattern, so i’ll keep an eye on this one! Ooh, I really like this one, and the yarn you chose. Definitely will be buying when it’s available! 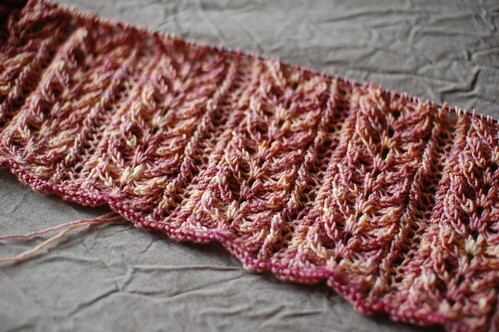 The stitch pattern is so beautiful, especially the way it shows up in that color! I hope you are able to write up the pattern. Love the pattern, and such a pretty colour. I can’t wait to see it finished! Laura, I’m sure you don’t usually have anyone but your close friends test-knit for you, but I’d really really love to test knit this. I’m not a stellar lace brilliante, but I’d probably be quick to notice anything confusing. 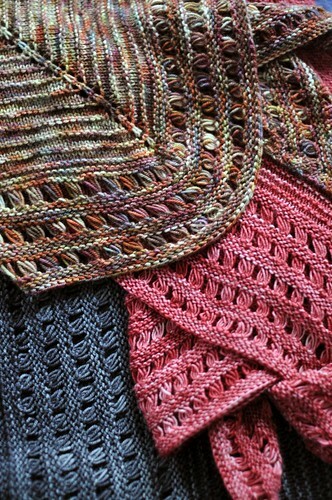 And I have two skeins of Noro Sock that would be GORGEOUS in this pattern. Really a showstopper. 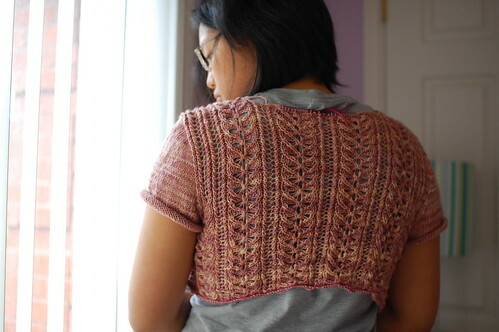 I will definitely take a shot at this gorgeous cardigan when you publish it. That lace pattern opens up so beautifully in the Socks that Rock, too. Yum. That’s truly beautiful – the pattern is gorgeous as is the wool. I so know what you mean about ripping and knitting and ripping – and then finally, the pattern is *cemented* in my head and I find myself chanting it for days! Nice to know that someone as talented as you experiences this dilemna! Very beautiful. I too would love to see this pattern made available. Hahaha, I’m the same way – I can’t deal with wearing pullovers, because I get too hot, so I stick pretty exclusively to cardigans nowadays. It’s shaping up just beautifully! I love the colors, as well as that gorgeous lace. Very pretty. I find that I make a fair number of pullovers (often turtlenecks), but wear my lone cardigan the most. Obviously I need to make more cardigans! I will happily wait for this one to come out. wow! I’ll be waiting for that one to be released, too–it’s fabulous! This is going to be a gorgeous sweater! Please, make it into an available pattern! That’s very nice – can’t wait to see if you do it in larger sizes and when someone will knit it… maybe me !!!! Yours is coming along beautifully! Oh my this is so lovely! I can’t wait for the pattern! As I’m learning to keep bees, this would be the perfect cardi for me to knit over the winter. Please publish it soon. p.s. The first card I ever knitted was your top-down raglan 2.0. Years, later, it’s still one of my favorites. Thanks. I have been reading your blog on and off since for the last four years, and although I never comment I love reading it. Your funny, and you makes me feel less alone in my ineptitude. I am a smart girl, but I am always fighting with my knitting. I recently bought the callie, and I have been working on her all summer. Sad, but true. I actually picked the callie, because the pattern had nice lines, great shaping and rows and rows of mindless stockinette. I work in film and summer is my busy season so on the weekends I want to sit, knit, and unwind. Your patterns are beautiful and I have loved watching your process evolve. This is coming along great so far. Leave a Reply to J.